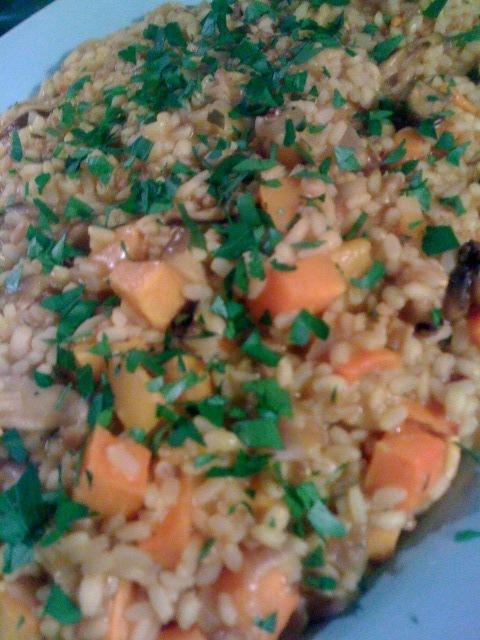 wwwI have been cooking and using the garden produce, but I haven’t had a lot of blogging time to post about it, so this post is just going to be a mishmash of what I have available. First, pizza! The next day, I used the rest of the basil I had picked to make some awesome, garlicy pesto. I didn’t really follow a recipe for it, I just added a bunch of washed basil leaves to the food processor along with some minced garlic, nutritional yeast and pine nuts, then streamed in some extra virgin olive oil while pureeing. So good! 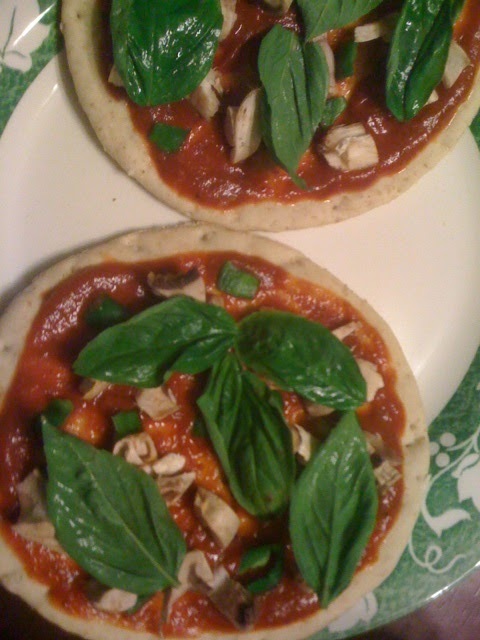 I used a little of it to mix with tomato sauce for some more mini-pizzas, but I didn’t take a picture of those. Start boiling the water for the pasta. Fry the tofu in the olive oil until browned on at least one side. I did this slowly, over medium-high heat, while I chopped the other veggies and chatted with my mom. This is one of those things that just takes some time, and you don’t want to stir too much, which is one of the hardest tasks for me. Add the pasta to the water in the other pot as soon as it is boiling. Once the tofu is browned on at least one side, addethe onions, mushrooms, and chilis. Gently fry all the veggies with the tofu, stirring occasionally. When the pasta is cooked al dente, ladle out a cup or so of the pasta water to add to the sauce, then drain the pasta. 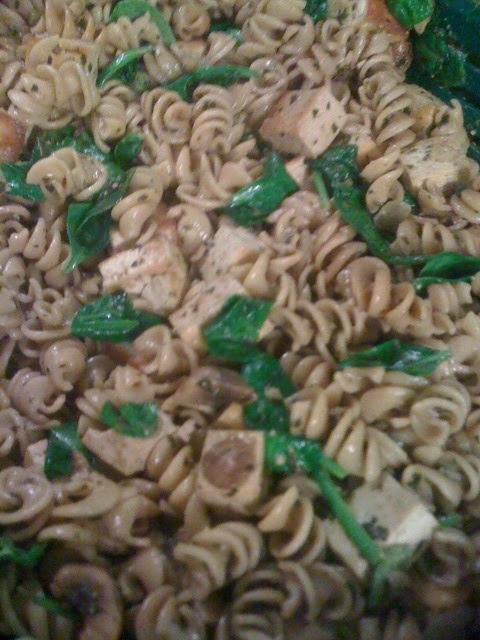 Actually did: Add the pasta to the skillet with the tofu and veggies, then add in the pesto and the reserved pasta water. Stir to mix, then add baby spinach in handfuls, covering to let the spinach wilt, then stirring and adding more until the spinach is all incorporated. Next time I will: Add the pasta water and pesto to the skillet with the tofu and veggies, stirring to make a slightly thinned out pesto sauce, adding enough liquid to make it saucy, but not so much as to make it too thin. Add the pasta to the skillet, stir to combine, and then start adding the spinach a few handfuls at a time. I also added a bit of Trader Joe’s everyday seasoning to this, because I add that to a lot of things these days. If you don’t have a Trader Joe’s nearby, or you don’t want to use a seasoned salt, Mrs. Dash salt-free seasonings are a good substitute. I meant to add some cherry tomatoes to the skillet right before the pasta was added, so that they would cook down some but not completely lose their shape, but I totally forgot. That would make it more like the restaurant dish, as would a bit of wine, but I forgot that, too. 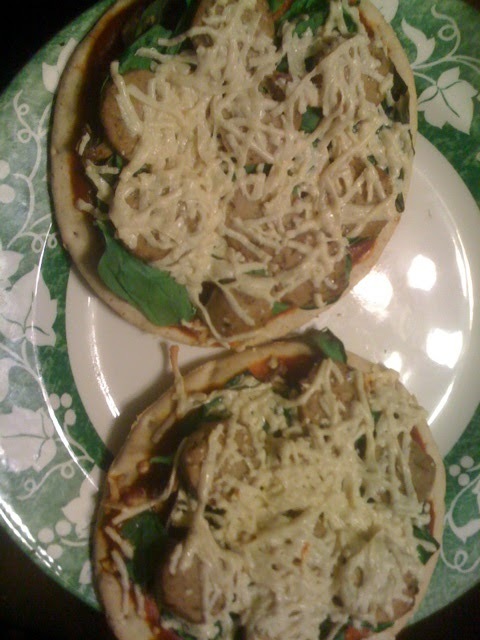 Next time, I will probably add a little bit of wine with the pesto, maybe half a cup of Pinot Grigio. I still have just a little of the pesto left, but I am not sure what I am going to do with that yet. Mostly, I just went out before cooking many, many things and got a small handful of fresh basil leaves to add to the dish. I did make the Sweet-Basil Tapenade from Veganomicon for my birthday open house, but I forgot to put it out, :-(. I ate some of it after the party, though, and it was a mixed success. I have been using the Grade B maple syrup lately for it’s richer maple taste, and that may have been a bit too much for the tapenade--I suspect it was supposed to be mostly pesto-y with some sweetness, but it was very sweet and maple-y, just a little too much. I may try again next year with some Grade A maple syrup, or less syrup or something. Like the mint, I should have been using more of this earlier. Although I did use basil a lot when it was growing strong (I don’t think there was a week that went by once it was coming in that I didn’t use it two or more times per week in recipes), I could have used a lot more when it was growing back in almost as fast as I picked it. I could probably have made a big batch of pesto every week and popped it in the freezer without noticing a decrease in the amount of basil I had available for other uses. In other news, I still have a lot of greens to use. 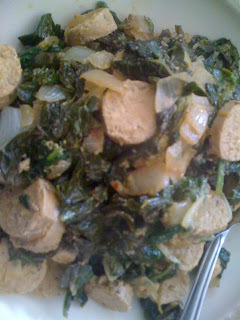 For brunch last weekend, I made the Collard Greens and Sausage recipe from Vegan Brunch, although I used turnip and mustard greens, mostly. It was really good, although I think I could have cooked it a bit longer. Doesn’t it look pretty, though? 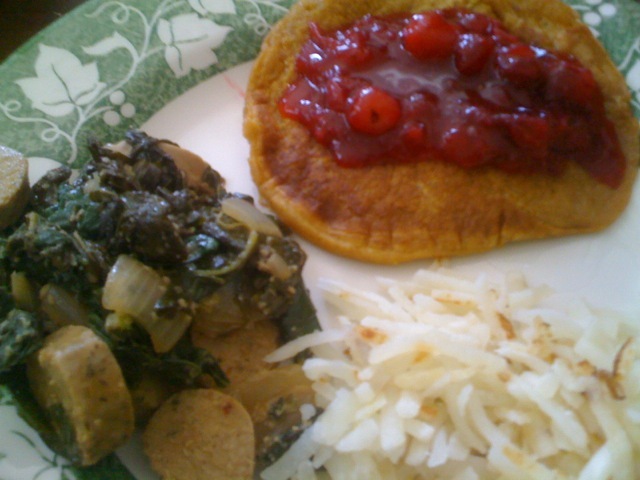 I made pumpkin pancakes and cranberry ginger sauce from Vegan Bruch as well to go with, along with hash browns. Such a yummy, nutritious and filling brunch! I have a LOT of parsley out in the garden. I cannot believe how well that herb is still growing. I gather that it is supposed to be biennial, but it never died off this summer, and it is still going strong out there. I think I am going to ask a friend to let me use her dehydrator to preserve the rest of it soon, because I don’t want to just let it die, but I am not sure what else to do with large quantities of the stuff. Another thing to research for next year. The garden is mostly done for the year. I have a few Anaheim chilis, and some turnips and beets to dig up, along with all the parsley, but my days of going out to pick dinner ingredients are numbered. I still have a big adventure figuring out what to do with all the turnips that are coming in, but for the most part, the work and preserving food is finished. I think I did pretty well this year, barring the time when I was broken and couldn’t do much. I am feeling pretty good about expanding the garden next year, and now I just need to start planning what I want to do with all the extra space. Also, I want to review these posts about what I did this year and what I want to do differently next year, along with some research for new things I can do next year to make sure I grow what I want and preserve it well. I have a few things that I will carry into the winter months this year, but not many. Next year, I would like to do a bit more preserving for long term. So, I don’t have to stop obsessing about the garden after all, even though this season is ending! That is a post for another day, though. Thank you for sharing this content, that is nice one…. I prefer it a lot and Hope other people might enjoy it also.